It started off with 80 former WPT Main Tour Main Event champions, but it was Matthew Waxman who outlasted that elite field to become this year’s WPT Tournament of Champions winner. The player claimed the title and the first-place prize of $463,375 after picking off a bluff from his heads-up opponent Matas Cimbolas. Waxman and Cimbolas were two of the five players who returned for Day 3 of the prestigious tournament. Instead of playing that final day at Aria Resort & Casino, the remaining survivors switched venues and their final battle thus took place at the brand new Esports Arena Las Vegas at the Luxor. 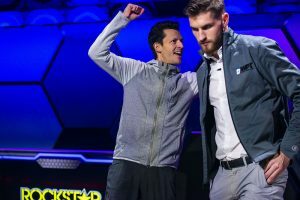 Waxman entered the final day of action third in chips, while Cimbolas held the second largest stack at the time when cards were thrown in the air. The five finalists were led by Darren Elias, who won his record fourth WPT title just a few days ago. The player maintained his momentum for a while, but then lost his chip lead to Waxman. Elias eventually busted in third place, thus missing the chance to win a back-to-back title and smash another record. He collected $177,060 in prize money. Nick Schulman was actually the first player to leave the final table on Day 3. He was eliminated in fifth place namely by Elias. His share of the $1,365,000 prize pool totaled $89,290. David Benyamine went out in fourth, good for $123,045. Waxman was the player to set the two-handed match after he eliminated Elias in third place. The eventual champion entered heads-up as a chip leader with 2:1 advantage over Cimbolas. The first half of their duel saw chips swinging back and forth from one player to the other and vice versa. Waxman then began to pull ahead of his final opponent until he took controlling advantage. On the final hand in play, the eventual champion check-called the three streets with [Qc][7d]. Cimbolas moved all in on the river with [10h][3s] on a [Kd][2h][Qs][4s][8h] board. Waxman quickly picked off his opponent’s bluff and called to claim the title and the largest share of the prize pool. Cimbolas exited the tournament in second place, good for $265,590. 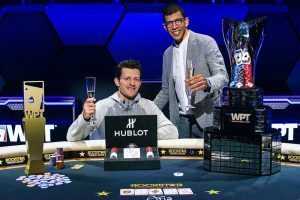 As for Waxman’s first-place prize, it also includes a $15,000 seat into next season’s WPT Tournament of Champions, a luxurious Hublot watch, a JetSmarter membership worth $50,000, and the one and only WTP Tournament of Champions trophy. Talking to WPT staff minutes after his triumph, Waxman said that it took him some time to decide whether he should play in the Tournament of Champions or not due to the high buy-in, the elite field, and the lack of much confidence in his game. It seems that he has made the right decision, though. The event concluded Season XVI of the popular poker series. As mentioned above, it attracted 80 entries, including the winners from throughout the season and players who had won WPT titles during previous seasons. A prize pool of $1,365,000 was generated to be split among the top 10 finishers, min-cashes starting from $39,840.